December is one of my favorite times of the year, but there is something about all of the spending and consequent waste (shipping boxes, gift wrap, etc.) that rubs me the wrong way. So I thought it would be fun to decorate a tree using recycled paper and cardboard, and I'm sharing three mini tutorials with you today. Click through to check it out. During the busy holiday season there's always less time for complicated DIYs, so simple down-and-dirty projects are much more feasible. In that vein, today we're sharing a fun tutorial which will show you how to create a gold Christmas ornament using thumb tacks! Click through to check it out. My Christmas tree is filled with my pictures and things that represent everyone in my family. This year I decided to make a little ornament with a sweet picture of my dog. Piper, my Vizsla is getting older but she is well loved and I can't believe we have nothing representing her on our tree. I love these pet photo pillows so here is how I made an ornament version for my tree. 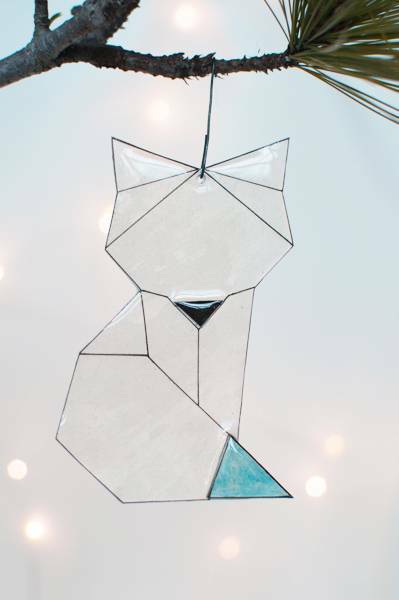 I don't know about you, but I'm always on the hunt for fun new DIY Christmas ornament ideas. So I was thrilled when I stumbled across this leather one with a bit of a mid-century modern vibe. Click through to check out the über cool final product. I love living right across the street from the public library. Sure, it makes checking out and returning things a breeze (and late fees inexcusable), but there's another benefit. Every six weeks or so, when I see the "Friends of Library Book Sale" sign hit the sidewalk, I can scootch right over and snag the best goodies for a cool 25¢ each. I wanted to give our front porch a little holiday love, but I wanted to do something other than the traditional wreath on the door. Enter: the vintage ornament doormat. Here's how to make your own! I'm not gonna lie. I'm still very much on the copper and brass train and I wanted a way to incorporate these warm metals into my Christmas decor this year. The answer, of course, was right in front of me: simple geometric ornaments! 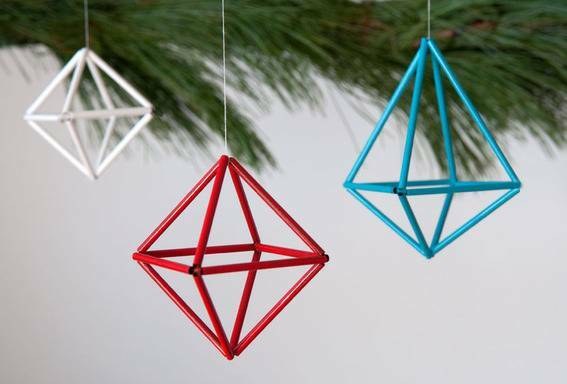 Read on to see how to make these modern Christmas accessories in minutes. Make It: Colorful DIY Stuffed Elf Plush Ornaments -- Free Download! We're excited to welcome Sibylle Roessler from Funkytime on the blog today! She's sharing a tutorial and free download for making your own stuffed elf Christmas ornaments. These Elf Christmas ornaments will add a little bit of magic and color to any Christmas Tree this year. They are so easy to make, even adults can do them, but only with kids supervision of course! They're a perfect little project for a snowy Sunday afternoon. Add a pop of seasonal cheer to a lonely side table with this easy DIY idea from Fellow Fellow! I don't know about you, but I spend most of my budget on gifts this time of year... which means that I don't have much to spend on ornaments and decorations. So a toilet paper roll snowflake sounds pretty good to me! Check out the surprisingly beautiful result after the jump.